This took me 15 minutes to make for a late night supper for one. Sam tried some when he got back from work and said it was really good, so i’ve written it up. Boil the water for your pasta – should be 1 litre/100g pasta and a good amount of salt (10g). And throw in the pasta. Meanwhile heat a frying pan to very hot and throw in the courgette strips with a dash of olive oil and a pinch of salt. Let them scorch a bit and then stir them. When they are soft-ish (but a few can still be a bit firm – and scorched quite a bit, remove from the pan and take the pan off the heat. Just before the pasta is ready, add 2 tablespoons of olive oil to the frying pan with the garlic and walnuts, and fry on a low heat for a couple of minutes until the garlic is lightly golden, then re-add the courgettes. Drain the pasta, saving ½ cup of pasta water. 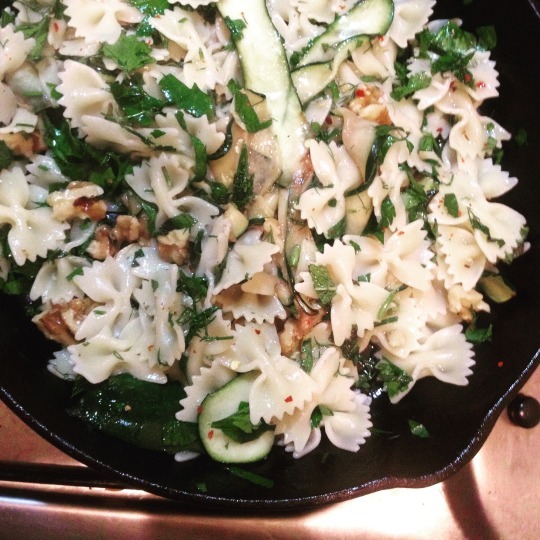 Add the pasta to the frying pan with courgettes. Mix in the herbs, a good pinch of salt, a hefty squeeze of lemon and a few chilli flakes if desired, along with an extra glug of olive oil and a dash of the saved pasta water.